EKK – Who’s Coming Up on Monday, January 28? Who’s Coming Up on Monday, January 28? From Spring Water to “Hot Springs”, WAIPUNA rocks! Waipuna opened EKK 2019 in true Hawaiian style – full of aloha, great music and memorable stories; they truly got the theme of “Music is Our Mo’olelo.” With visitors from Switzerland, Germany, Japan, South Korea, Canada, mainland USA, EKK loyals were back in full stride greeting their Kaua’i friends after nine months of absence with leis, honi honi, hugs and smiles. EKK is one big ‘ohana. Whether it was extemporaneous or whether it was a brilliant PR move, Kale started out by saying that their playlist for the evening was their five CD’s and that they would just pick two songs from each CD. Holding up the CD was a smart visual move as folks bee-lined to the CD table to score a copy of some “out of stock” albums; Baby Boomers like to walk out with a hard copy CD in their hands. Waipuna did not bring enough CD’s. Sold out! Holding up their first CD titled Mana’o Pili, they started their program with Uncle Willie K’s song Malama Mau Hawai’i in which he calls on voices of kupuna for guidance to help take care of all things Hawai’i — a concept most important to Waipuna. They love to take old tunes and breathe new life into it with their contemporary arrangements. From the first song to the last, Waipuna shared the songs that tell their story best with Kale’s deep-voiced narrative, David’s flying ‘ukulele fingers speaking volumes and Matt’s spot-on storytelling. It was hard to believe that Matt was still on Japan time as he just returned earlier in the day from their Japan tour. The second song on their first CD was Papa Sia where David had a chance to showcase his brilliant ‘ukulele pa’ani. Another song from the second CD was Kona by Lydia Kekuewa, one of the songs taught to the ‘ukulele circle earlier. Kale asked all the ‘ukulele players in the audience to join in with the singing and the playing. 2018 was a significant year for Waipuna as they celebrated their ten years as a group. Water travels from the sky and falls on the earth and forms fresh water springs underground which help to perpetuate life. Where wai means water, waiwai means wealthy. To this end, they wanted to acknowledge the wealth of experiences and relationships they have received during this past decade making music together by recording their latest album called Waipuna. Noted Hawaiian language expert, Puakea Nogelmeier, composed the song Waipuna as the title track for this album. Waipuna means “fresh water spring” or the source of the spring water. After hearing this group perform, I will now call them “Hot Springs” because their music surrounds you in a way that is both relaxing and exhilarating. In 2010, in preparation for their second album, Matt and Kale escaped to Koke’e for ahuaka’i devoted to musical research in a quiet hideaway, courtesy of the Wichman ‘ohana, with no cell coverage and internet service. They started with 40 songs and whittled it down to the 20 best songs which they arranged in Koke’e. Significant during their retreat was the loud crash that startled them in the middle of a dark and rainy night. They aborted their pitch-dark investigation in the middle of the night; it wasn’t until their early morning exploration that they discovered a huge koa tree had crashed to the ground . . . fortunately, it fell in the opposite direction of the house. The breaching whales, the thunder and lightning, the fallen tree all added to the inspiration from this trip. The irony was thatKoamalu, the name of the Wichman cabin, means “under the shade of the koa tree.” Kale led the vocals on their original O Koke’e composed by Kale in the cabin. This album titledE Ho’i Mai won them three Na Hoku Hanohano awards. In their third CD titled Napili, Robert Cazimero captures the adventures of his hula halau’s visit to Kohala in the song Aloha E Kohala, a song with poetry that rolls off the tongue. Known as the cornucopia of Hawai’i because of its great abundance, Kohala is a place that speaks to everyone in different ways. They shared stories of Pololu Valley where the famous Sproat Family compound has been home to generations of Sproats; the family has devoted their lifetime as stewards of the valley. 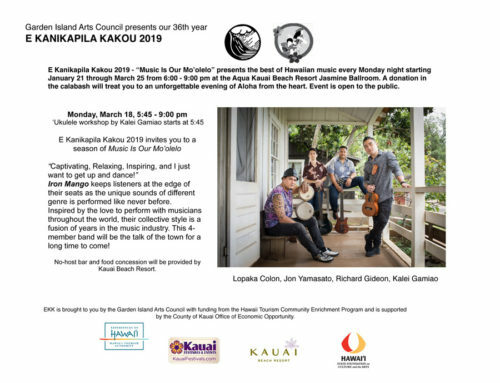 The musical lineage of Kindy Sproat is part of Kohala history. 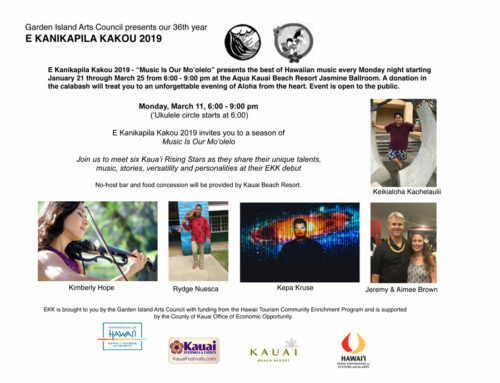 Manu Boyd, a student of Robert Cazimero, and Randol Ngum, composed a song titled Na ‘Ale O Ni’ihau about the shells found on Ni’ihau beaches. With a catchy beat and powerful harmony, the deep booming voices of the trio did the song much justice. Waipuna later picked up David Kamakahi to join the group. The title tract of their fourth album called E Mau Ke Aloha was composed by Dennis Kamakahi in 1985 as his eighth wedding anniversary gift. David shared that his father’s songs fell into three categories – songs inspired by his environment, songs inspired by people, and songs that were apologies. As a musician who had to be on the road much of the time, Dennis often couldn’t afford gifts that he wanted to give his wife, so what he did instead was to compose a song as his gift. The lyrics speak of the “days of roses and wine” and that “it’s always love that makes it all right” . . . definitely words that speak of the love he felt for his woman. Kale Hannahs pointed out that these songs are gifts that keep giving . . . in royalties. In 2014, Waipuna had just completed playing hula music at the Merrie Monarch celebration in Hilo. When they got home to Honolulu, David called the group to the hospital where Dennis had been hospitalized with cancer. They spent the evening playing music for Dennis; later that evening, he passed away. The following day, the trio went into the studio and recorded the song One More Day which poses the question, “What would I do if I had one more day?” Kale said the real message of the song is to live your life fully and show your appreciation of others and don’t wait until you have to ask that question. This song is on their fourth album titled E Mau Ke Aloha. Before the intermission, the musicians were asked to demonstrate the Kamoa ‘ukulele that was going to be given away. Matt launched into a sweet falsetto that delighted the audience. After intermission, the lucky winner of the ‘ukulele was Sue Labeaume from Perry, Georgia. 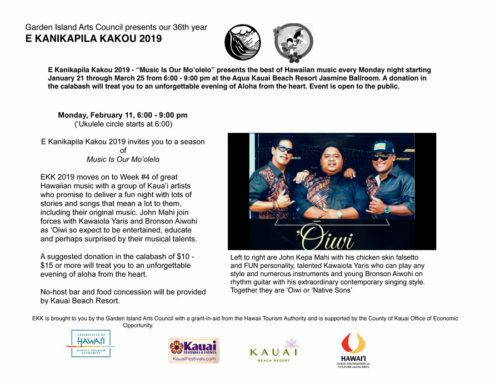 As a plug for their upcoming tour, Kale shared that on the upcoming Presidents’ Day holiday, Waipuna will be playing music in Concord and Cupertino. Matt recapped their unforgettable adventures while on tour, such as Kale being chased by a deer in Nara, Japan. All their trip highlights can be seen on their website,www.waipunaonline.com. The second half of their concert was packed with even more songs and stories. Another Dennis Kamakahi song titled Na Ali’i Puolani speaks about the powerful Chiefs of Maui. At that time Dennis was studying his own genealogy and discovered his connection to the Chiefs of Maui. 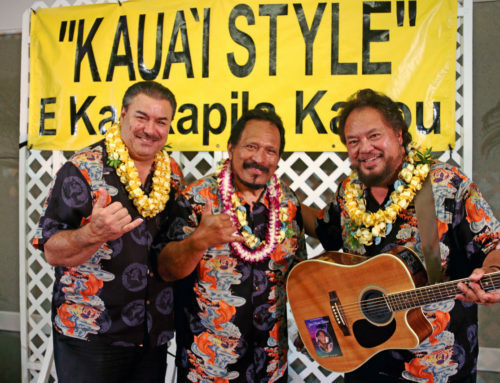 After Dennis Kamakahi’s untimely death, Waipuna was asked to perform a tribute to Dennis at the 2015 Na Hoku Hanohano event. To share his wealth of compositions that is his musical legacy, the trio arranged a medley of his three best-known songs, but they wanted to put a special spin on the medley by performing each song as performed by a different musician in a style that was appreciated by Dennis. Wahine Ilikea about the waterfalls on Molokai was sung in Dennis’s style; Pua Hone, his marriage proposal song, was sung in the harmonious style of the Cazimero Brothers; and Koke’e was sung in Loyal Garner’s zesty style. As each song was sung, hula dancers magically emerged out of the crowd and moved like flowers swaying in the wind, each in his or her own style — Po’ai Galindo, Elena Gillespie, Mauli’ola Cook, Holly Namaka Lindsay, Yumi Teraguchi, Blaine Sasaki, Donna Stewart, Mahina Baliaris, and several others helped to celebrate the musical legacy of one of Hawaii’s most prolific composers. Audience shouted out in appreciation as dancers mesmerized them. David recapped his earlier comment about the inspirations that resulted in his father’s compositions, i.e. Wahine Ilikea was inspired by a place in Molokai, Pua Hone was a song for his wife-to-be Robin, and Koke’e was a song of apology. How is that? Kale and Matt laughingly prodded David to share the story behind the song. As David told the story, the audience leaned forward in anticipation. As a member of Eddie Kamae’s Sons of Hawai’i,Dennis was part of the huaka’i to spend a weekend up on Koke’e with no distractions along with Feet Rogers, Joe Marshall, Moe Keale and Eddie. While Eddie drove down the hill to pick up groceries, the four Hawaiians decided to build a fire in the fireplace because the Koke’e chill was setting in. When Eddie and the cabin owner returned with their groceries, they witnessed heavy smoke pouring out of the windows. Rushing in to check the damages, the cabin owner asked them, “What are you Kanakas doing? Did you open the flue?” The four perplexed musicians looked at each other and asked, “Flue? What dat?” He raced to the fireplace and flipped a switch; like a genie out of the bottle, all the smoke in the cabin went up the chimney in one giant “swoosh.” Hence, the famous and beloved song about Koke’e was composed as an apology to the cabin owner. The cabin still stands. Matt, in his engaging story-telling style, introduced the song Ali’ipoe about the couple that agreed to meet under the Ali’ipoe tree. Well, that particular tree grows only three feet tall so the question is, “How does one have a meeting under the Ali’ipoe tree?” It doesn’t take much imagination to figure out the simple answer is that one has to meet in a prone position. Matt’s soaring falsetto helped to conjure up everyone’s imagination while the exquisite hula dancer Mauli’ola Cook mesmerized the entire audience with her extraordinary hula story-telling of the secret assignation of two lovers under the very short Ali’ipoe tree. Since Monday, every person I met who was at this event had to mention the breathtaking beauty of Mauli’ola’s hula. What a gem of a hula dancer she is. What’s so special about Waipuna is that they consciously sing their hula songs so that dancers can dance to them. Fulfilling song requests, they sang Nui Ke Aloha No Kaua’i which speaks about all the favorite huaka’i spots on Kaua’i that are treasured and enjoyed by everyone including Waipuna. In 2018, Waipuna expanded their tour to Europe but they performed in Japan at least once a month. While on tour they enjoy the after-concert activities which includes finding a restaurant with great food followed by a late evening at a Karaoke bar where they get to learn Japanese songs. Sharing one of their favorites, Shimanchu Nu Takara, where the Okinawan people recount their many Island Treasures in a style similar to Hawai’i. When Waipuna performed this song in concert, the entire audience shouted out their favorite I ya sa sa! I ya sa sa! so it was a really chicken skin experience for them. They included this version in their CD. For their final hana hou number, David Kamakahi treated the audience to his version ofJus’ Press, a song that took years of concentrated attention while sitting in the front row at Led Kaapana’s every performance. When he finally had the nerve to play it in front of the master, Led Kaapana nicknamed him “Damn Keed!” David’s command of the ‘ukulele on this song is simply a show stopper. Everyone joined hands for the final joyous singing of Hawai’i Aloha. Who could ask for anything more? We all basked together in a wonderful evening in the “Hot Springs” of Waipuna. 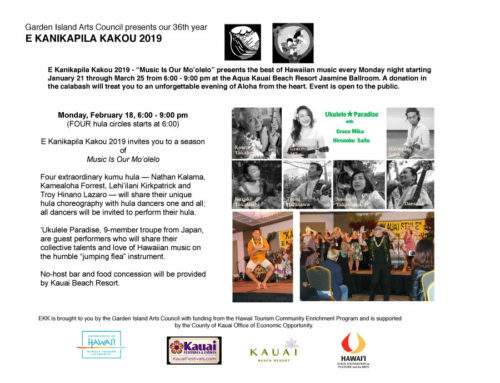 E Kanikapila Kakou 2019 Hawaiian Music Program is funded in part by the Hawai’i Tourism Authority, supported by the County of Kaua’i Office of Economic Development, the Kaua’i Beach Resort, and the GIAC/EKK supporters.